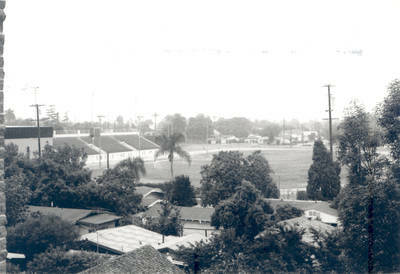 "View overlooking the Hutton Sports Complex at Chapman College, Orange,"
View from Hashinger Hall overlooking the Hutton Sports Complex at Chapman College, Orange, California, 1979. Rooftops of residences and trees in the foreground; the stadium and athletics field in the background. BW photograph; 3.125" x 4.125"